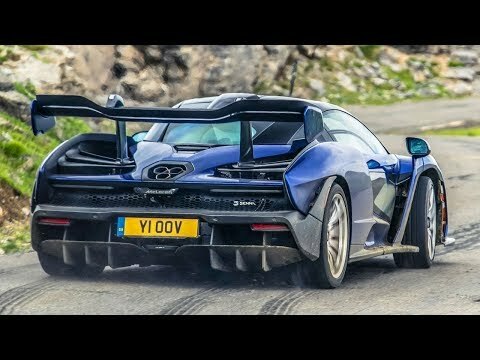 The McLaren Senna is a track focused machine. It is made for fast lap times that will make you feel like you are the late Formula 1 racer, Ayrton Senna. With a name like Senna, the McLaren has huge shoes to fill. It is made for the track, but it is a road legal race car for the road, so how does it drive on the street? McLaren Special Operations has created a special bespoke Carbon Theme version of the McLaren Senna. The special edition of the supercar will make its debut at the Geneva Motor Show on March 6th. The Carbon Theme features visible carbon fiber weave over the majority of the vehicle. On the exterior the few sections without visible carbon fiber feature Solar Yellow and Laurel Green. These colors pay homage to Ayrton Senna based on his helmet livery. On paper the McLaren Senna is the type of car any enthusiast wants in their garage. However, one does have to look at the outside of the car from time to time and this one is as beautiful as a turd. Normally we love McLaren styling, but there is something funky with the styling of the Senna that is hard to put our finger on. It looks a bit like the supercar that Homer Simpson might design. Even though we aren’t fans of the styling, the performance is enough to make us want to get in the driver’s seat. I mean if we had McLaren Senna kind of money, buying a blind fold to wear while our butler walked us to the car isn’t too much to ask. However, even if you are worth billions and wanted to buy a McLaren Senna it is too late.